But Vancouver is back to its old tricks, and Toronto is seeing a temporary bounce. For sale signs line in Calgary, Alta., April 7, 2015. Calgary was among the cities that saw falling house prices in January, according to the Teranet-National Bank house price index. House prices fell in a majority of Canadian cities in January, the first month of tough new mortgage rules at the major banks, new data shows. The latest edition of the Teranet-National Bank House Price Index shows prices falling in seven of the 11 cities covered. Among them are Ottawa-Gatineau, Hamilton, Calgary and Edmonton. Halifax, Quebec City and Winnipeg saw particularly steep drops for a single month, with each city's price index down at least one per cent. It's a different story in Vancouver, where the market appears to be up to its old tricks again — rapid house price increases. The city's price index is up 1.2 per cent on the month, and up nearly 17 per cent over the past year. Detached home prices in the city are up 13.5 per cent over the past year, while condos have soared by 23 per cent. Without Vancouver, the national house price index would have dropped for the fifth month in a row, National Bank senior economist Marc Pinsonneault said. But with Vancouver included, it rose 0.3 per cent in January. "The fact is that Vancouver's home resale market remained tight even after the introduction of a tax on acquisitions by foreigners," Pinsonneault wrote in a client note Wednesday. "The same cannot be said of Toronto, where the market turned from tight to balanced after the introduction of a similar tax last April." House prices in Toronto turned positive for the first time in six months in January, rising a modest 0.2 per cent. But prices in the region have fallen by 7.2 per cent since they peaked last July. And Pinsonneault doesn't expect this month's positive numbers for Toronto to last. He suggested the strength in January's numbers was due to buyers rushing in to buy with pre-approved mortgages ahead of the new mortgage rules. "With further increases in mortgage rates still to come ... it is premature to conclude that home prices have definitely turned the corner in Toronto," Pinsonneault wrote. Under new mortgage rules put into place at the start of the year, borrowers of traditional mortgages (20 per cent or more down) have to pass a "stress test" to ensure they can still afford their mortgage at a rate that is some two percentage points higher than the offered rate. That follows a similar rule that was put into place in 2016 for borrowers who put down less than 20 per cent. Experts say the new rules are bound to have a significant impact on homebuyers. Mortgage comparison site Ratehub estimated that the rule will reduce buying power by about 21 per cent. 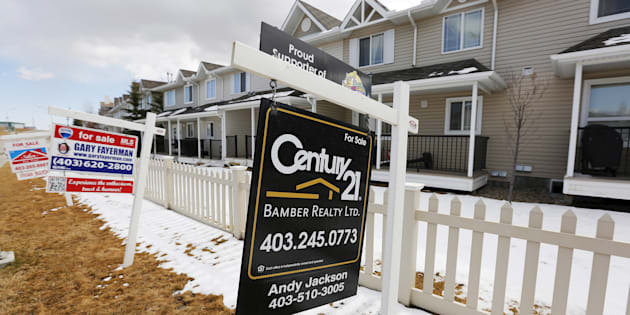 The Bank of Canada predicts it will disqualify one in 10 would-be mortgage borrowers. But the rules apply only to the major banks that are overseen by the federal banking regulator, OSFI; they don't apply to alternative lenders such as credit unions. The result is that would-be borrowers are increasingly turning to these less strictly-regulated alternative lenders. Some brokers say they have seen an uptick in business recently, the result of a greater numbers of borrowers being rejected by the major banks.